Front Row: Sugar Plum Market Co-Chairs Heather Brown and Heather Allen. Back Row: Patti Parish-Kaminski, absolutely! 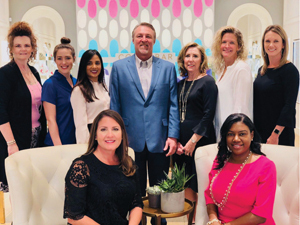 focus media; Haley Peck, Johnson Development Corporation; Malisha Patel, Memorial Hermann Sugar Land; Mike Shaw, Sterling McCall Nissan; Kim Zeiner, Houston Lifestyles; Jamie Hill, Pamela Printing and Stephanie Mahler, Briscoe Manor. The Sugar Plum Market is a great way to kick-off the holiday season in Fort Bend County, but more importantly, it’s a wonderful opportunity to give back to a number of worthy charities. “Oh, What Fun!” is the theme of the 18th Annual Market, which will pay tribute to the many organizations that have benefited from the Market proceeds through the years. The Fort Bend Junior Service League (FBJSL) and Memorial Hermann Sugar Land invite the community to join them for what is sure to be another stellar event. The Market will take place at the Stafford Centre Performing Arts Theatre and Convention Center Friday, November 2nd and Saturday, November 3rd. Preview Night has been set for the evening of Thursday, November 1st. The 2017 Sugar Plum Market raised over $280,000, which benefited 24 charitable organizations in Fort Bend County. The continued success of the Market would not be possible without the support of sponsors and donors. In addition to the 2018 Sugar Plum Market’s Title Sponsor, Memorial Hermann Sugar Land, top sponsors to date include the Stafford Centre for the Performing Arts, Lifestyles Magazines, absolutely! media, Sterling McCall Nissan, Briscoe Manor- “The Barn”, Behind the Bash Catering, The Tallest Tulip, Randalls, H-E-B, Johnson Development Corporation, Harris Machine Tools, Vintage Farming Co. and Pamela Printing. Sugar Plum Market tickets may be purchased at sugarplummarket.com or at local Randalls stores. Preview Night tickets (limited quantity available) are $75 and General Admission tickets are $12 in advance or $15 at the door.